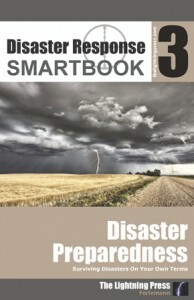 Announcing our latest SMARTbook, Disaster Response SMARTbook 3 – Disaster Preparedness (DRS3). Sometimes things go badly and all our hopes and plans fail us. Our illusions are shattered, our expectations are beyond anyone’s capacity to fulfill, and our demands go unanswered. When this time comes, what will you do? Anytime you are reading about survival, you are reading about resiliency. Resiliency is the ability to recover quickly from setbacks. Preparation for emotional or physical challenges is part of the process, but there is no magic formula for resiliency that will make a disaster less destructive, disruptive, or devastating. True resiliency is more than just having a plan: it is a mindset, a decision made before the crisis that you have chosen to survive. Disaster management (or emergency management) is the term used to designate the efforts of communities or businesses to plan for and coordinate all the personnel and materials required to either mitigate the effects of, or recover from, natural or man-made disasters, or acts of terrorism. Incident management (IcM) is a term describing the activities of an organization to identify, analyze, and correct hazards to prevent a future re-occurrence. These incidents within a structured organization are normally dealt with by either an Incident Response Team (IRT), or an Incident Management Team (IMT). Defense support of civil authorities (DSCA) is support provided by federal military forces, Department of Defense (DOD) civilians, DOD contract personnel, DOD component assets, and National Guard (NG) forces (when the Secretary of Defense [SecDef], in coordination with the governors of the affected states, elects and requests to use those forces in Title 32, United States Code, status or when federalized) in response to requests for assistance from civil authorities for domestic emergencies, law enforcement support, and other domestic activities, or from qualifying entities for special events. Download a free PDF sample and learn more at: Disaster Response SMARTbook 3: Disaster Preparedness (Surviving Disasters on Your Own Terms). Read more about Homeland Defense (HD), Homeland Security (HS), and Defense Support of Civil Authorities (DSCA) in “HDS1: The Homeland Defense & DSCA SMARTbook“.